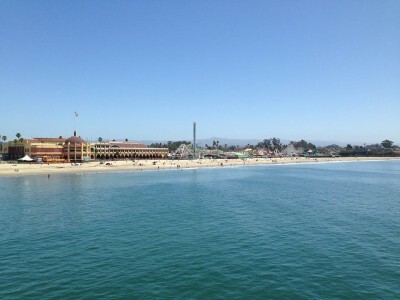 The Santa Cruz Beach Boardwalk…just mention the place and I can smell the cotton candy. Around here we all have our own special memories of the boardwalk; walking the strip at dusk hand in hand with your sweetheart, being lured into indigestion by the intoxicating smells of the funnel cakes and garlic fries, getting stuck upside down in the cage ride and having all the change fall out of your pocket onto the cages below, running into almost everyone you know on dollar night, bringing the kids and reliving your own childhood fun all over again through them. In 1865, John Leibrandt opened a public bath house in Santa Cruz near the mouth of the San Lorenzo River to capitalize on the new fad of bathing in natural salt water. Its popularity grew and as more and more tourists came, restaurants, shops and various stands started popping up in the vicinity. By the late 1880s, the spot caught the eye of entrepreneur Fred W. Swanton who saw the possibilities, a future “Coney Island of the West” and he started making plans for a grand casino and boardwalk. The casino opened in 1904. It lasted less than a year before it was destroyed by a fire. Legend has it that before the last of the smoke had cleared, Swanton was on the phone securing the financing and materials necessary to rebuild. In 1907, the new casino along with a ballroom, indoor pool (the Plunge), pier and boardwalk were unveiled. The first ride was the L.A. Thompson Scenic Railway which opened in 1908 and cost $35,000 to build. In 1911 came the carousel and pipe organ which is still in use today. By 1924 they had replaced the railway with the Giant Dipper roller coaster, one of the first roller coasters to be built. It is now one of the oldest roller coasters in the United States as well as in the world. 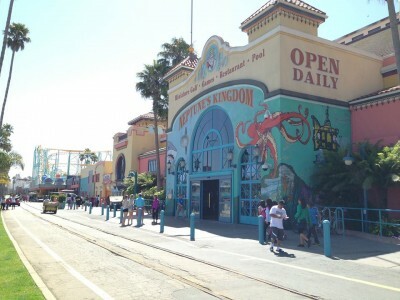 Both the Giant Dipper and the carousel are recognized National Historic Landmarks. 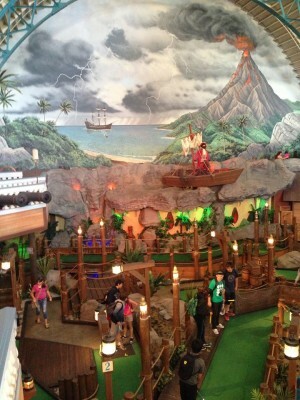 The Plunge, the old indoor pool, is now Neptune’s Kingdom which houses a Pirate themed two-story, 18 hole miniature golf course complete with animatronics and effects. There are also pool tables, air hockey and mini arcade. The casino was turned into a large arcade stocked with the latest games plus several pinball machines, a shooting gallery, laser tag, skee ball, and more. My favorite part of the arcade is the “Classic Corner” where you can find all the old school video games from the 80s: Q-bert, Pac Man, Galaxia, Tetris, Space Invaders, Centipede, and my favorite, Gorf. Free Friday Night Concerts at the beach. These concerts are extremely popular and you’ll want to come early and save your spot with a blanket or low-backed chair. Dress warm! Discount nights. From June 17-August 29, Monday and Tuesday are $1 nights. Rides, Cotton candy, hot dogs and Pepsis are only $1. It used to be 25 cent night, but who’s complaining? With each ride at 3-5 tickets and each ticket costing $1 each, you’ll want to take advantage of this deal! On Wednesdays and Thursdays after 5PM, bring in a Pepsi can and pay only $12.95 (plus tax) for unlimited rides (not valid 7/4). Free movie night on the beach is every Wednesday night from June 26-August 14. Seating is first come, first serve. On the schedule this summer are two of the most famous films shot in Santa Cruz: “The Lost Boys” shot on location on the SC beach boardwalk and “Mavericks” shot on West Cliff with scores of Santa Cruz local surfers cast as extras. Across the street from the boardwalk is the local bowling alley The Boardwalk Bowl and Coasters Bar and Grill with live music and Karaoke. You never know exactly what’s going to happen on Karaoke night, but you can always count on being entertained. It might be the homeless-looking guy who wanders in and unexpectedly knocks your socks off or you may just want to claw your eyes out listening to one of the regulars perform a favorite…or you just might be lucky enough to hit one of the nights that local Grammy nominee Tammi Brown decides to show up late and show everyone how it’s done as she brings down the house with her rendition of “Summertime”. Another fun option is to take the beach train. Departing from Roaring Camp in Felton, you can travel “one of the oldest and most historic lines in California” through the redwoods right to the front door step of the Santa Cruz Beach Boardwalk.